What is an Essential Habitat? In 1988, the Maine Legislature amended the Maine Endangered Species Act by adding habitat protection provisions in recognition of two issues: 1) the effect habitat loss has on endangered and threatened species in Maine, and 2) the confusion and sometimes costly problems that can arise in the absence of a consistent and predictable land use decision-making processes for endangered and threatened species. As a result, the Maine Department of Inland Fisheries and Wildlife (MDIFW) may designate areas as "Essential Habitat" for species listed as endangered or threatened, and develop protection guidelines for these Essential Habitats. Essential Habitats are areas that currently or historically provide physical or biological features essential to the conservation of an endangered or threatened species in Maine, and which may require special management considerations. Examples of areas that could qualify for designation are nest sites or important feeding areas. For some species, protection of these kinds of habitats is vital to preventing further population declines or achieving recovery goals. Essential Habitat pertains only to definitions under Maine's endangered species laws (12 MRSA, Chapter 925, Subchapter 3, Sections 12804 and 12806) and regulations established by the Maine Department of Inland Fisheries and Wildlife (MDIFW Rules, Chapter 8.05 (MS Word)). How is an Essential Habitat Designated? Before an area is designated an Essential Habitat, it must be identified and mapped by MDIFW and adopted through public rulemaking procedures, following Maine's Administrative Procedures Act. MDIFW first designated Essential Habitats and protection guidelines through rulemaking in 1989 for bald eagle nest sites. 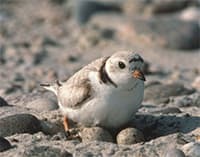 Since then, MDIFW designated Essential Habitat for three state endangered species: the roseate tern, least tern, and piping plover. In 2007, Maine's Legislature removed the bald eagle from Maine's Endangered and Threatened Species List, and MDIFW removed its designated Essential Habitat in 2009. Additions of newly qualified areas, as well as deletions of sites no longer eligible, are ongoing for the other three species. In the future, MDIFW may designate Essential Habitats for some of Maine's other listed species. What Happens When an Area is Designated as Essential Habitat? Once an area is designated Essential Habitat, the Maine Endangered Species Act requires that no state agency or municipal government shall permit, license, fund or carry out projects that would significantly alter the habitat or violate protection guidelines adopted for the habitat. If a project occurs partly or wholly within an Essential Habitat, MDIFW must evaluate the project before a state agency or municipality approves the required permits or project activities can take place. MDIFW does not require any additional permits or fees. Designation of Essential Habitat simply establishes a standardized review process within existing state and municipal permitting processes. Essential Habitat designation does not affect activities of private landowners unless they require a state or municipal permit. MDIFW applies this regulatory habitat protection tool only when they have identified habitat loss as a major factor limiting species recovery. MDIFW adopts in rule (MS Word), criteria for designating sites as Essential Habitat, protection guidelines, factors considered during project evaluations, and maps showing areas currently designated as Essential Habitat. Before MDIFW initiates Essential Habitat rulemaking, they contact affected landowners and municipalities to inform them of the proposal and to invite their input and participation. After MDIFW adopts the rule, MDIFW provides copies of official maps and supporting documentation, as well as information on the Essential Habitat review process, to state and municipal permitting officials. Essential Habitat maps and information are also available from all MDIFW offices, and anyone can order digital coverage from the Maine Office of GIS Data Catalog. What are the Benefits of Essential Habitat Designation? Designating Essential Habitats, and making the information readily available, have greatly benefited both the resources and the people of Maine by successfully reducing potential conflicts between endangered species' habitat and land use concerns. Landowners, developers, land use planners, state agencies, and municipal governments now know where these regulated habitats are, and they have standardized, predictable, and reasonable guidelines to follow. By becoming involved early in the planning and permitting process, MDIFW is also able to work with agencies and project applicants to identify incompatible projects up front and resolve avoidable conflicts before problems arise. 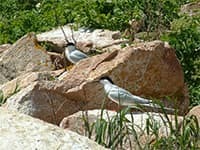 After nearly two decades of implementation, Essential Habitat has not only helped to ensure continued availability of quality habitat for Maine's endangered and threatened species, but has also become an important tool in building cooperative and productive relationships between MDIFW and other state agencies, municipalities, landowners, and project planners. MDIFW encourages anyone who wishes to manage their lands to enhance habitat for wildlife to contact one of the Department's Regional Wildlife Biologists for assistance. Which species currently have designated Essential Habitats? What are the Steps in the Essential Habitat Review Process? These are three steps a municipality or state agency must take to address Essential Habitat concerns when reviewing or proposing projects within their jurisdiction. Determine if the proposed project is in or near an essential habitat. All Essential Habitats are mapped on satellite imagery and are indexed by a map grid. Official maps are filed at the Secretary of State's office, and copies of official maps are available from all MDIFW and affected town offices. Advisory maps can be viewed and printed from MDIFW's website. Digital coverage can also be downloaded from the Maine Office of GIS Data Catalog. If the proposed project is located partly or wholly within an Essential Habitat, go on to Steps 2-3. If the proposed project is clearly outside an Essential Habitat, STOP: these regulations and review procedures do not apply. Consult with the MDIFW Regional Wildlife Biologist. It is advised that applicants considering projects within Essential Habitats initiate early consultations with the appropriate MDIFW Regional Wildlife Biologist, so that concerns for endangered or threatened species can be incorporated into preliminary project planning and design. Municipalities and state agencies should request assistance from the Regional Wildlife Biologist during initial project reviews and before seeking final MDIFW evaluation. Early involvement of MDIFW will help to minimize or avoid potential conflicts, facilitate cooperation between all parties, and enable quick turnarounds on project evaluations. Submit a "Request for Project Evaluation" to MDIFW. If the project meets municipal or state review standards and is recommended for approval by the town or state agency, an evaluation of the final proposal must be obtained from MDIFW before a formal decision can be issued. Town or state officials request an evaluation by submitting a "Request for Project Evaluation" (PDF) (MDIFW Form EHR4/03) with information and required attachments provided by the applicant. MDIFW will evaluate the final project proposal according to review standards established for Essential Habitats, and determine if the project would significantly alter the habitat or violate protection guidelines. Conditions agreed to as safeguards for the Essential Habitat must be itemized in the permit application, site plan, or other project documentation. Site visits and discussions with the project applicant may be necessary if they have not previously occurred. MDIFW will notify the town or state agency of the results of its evaluation. The town or state agency issues a decision based on the Department's evaluation and notifies the project applicant. Endangered and threatened wildlife habitats also receive protection under the Significant Wildlife Habitat provision of the Natural Resource Protection Act (38 MRSA, Chapter 3, Subchapter 1, Section 480-B). The designation of Essential Habitats is an ongoing process, where MDIFW adds or deletes sites and/or revises protection guidelines following public rulemaking. Please refer to this website to be certain you are consulting the most current Essential Habitat maps and documents. Bald eagles are no longer recognized as a Threatened Species under either federal or Maine law, and the Essential Habitat designations and state regulations applied to nest sites of bald eagles during 1990 - 2009 are no longer in effect. Now that the status of bald eagles is downgraded to that of "Species of Special Concern," MDIFW reviews only projects requiring a Site Location of Development permit from the Maine Department of Environmental Protection. 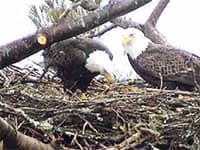 An Internet mapping system for bald eagle nests identifies locations currently documented by both state and federal wildlife agencies. To view Microsoft Word files, you will need the free Excel Viewer.